I was excited to make dinner tonight. It was a recipe from the bonappetit website for Seared Asian Steak and Mushrooms on Mixed Greens with Ginger Dressing (quite a long recipe title, eh?!) and seemed like the perfect solution for a warm Spring evening. For once I nearly followed the recipe, only taking a few shortcuts. Usually my kitchen shortcuts don’t make too much of a difference in the final product but today it showed. I really SHOULD have toasted the sesame seeds and I really SHOULD NOT have bought cheap steak and then overcooked it too! 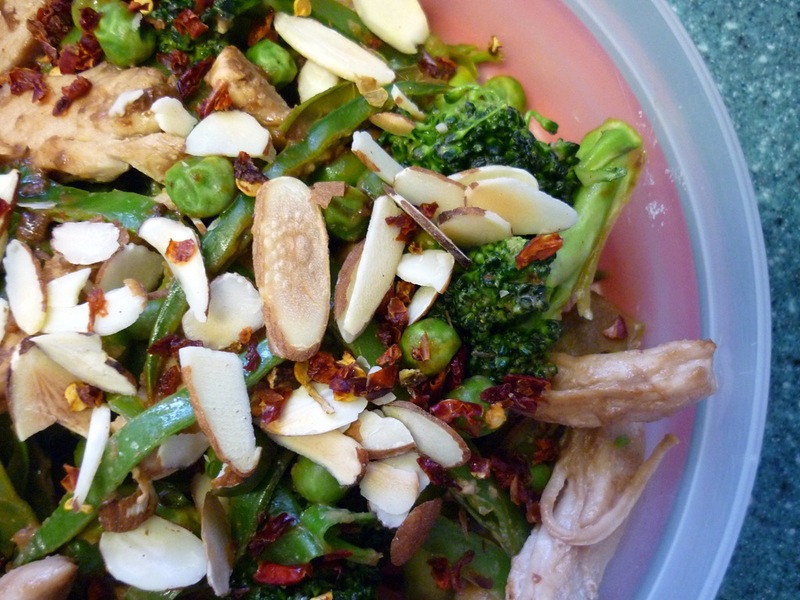 Despite this salad’s washed out looks it really DID taste good. 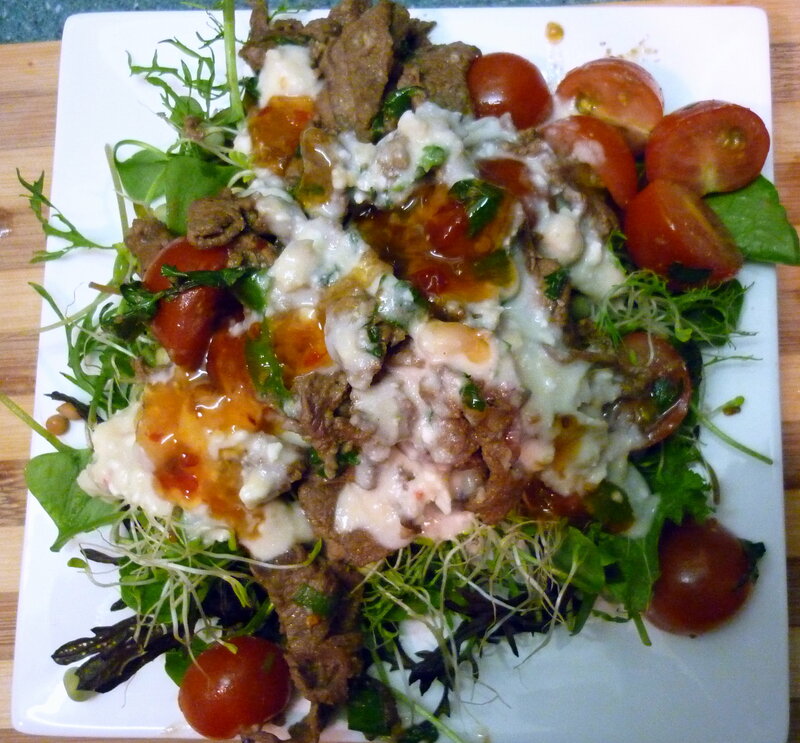 The meatiness of the mushrooms goes fantastically with the steak and the dressing is delicious and zingy. 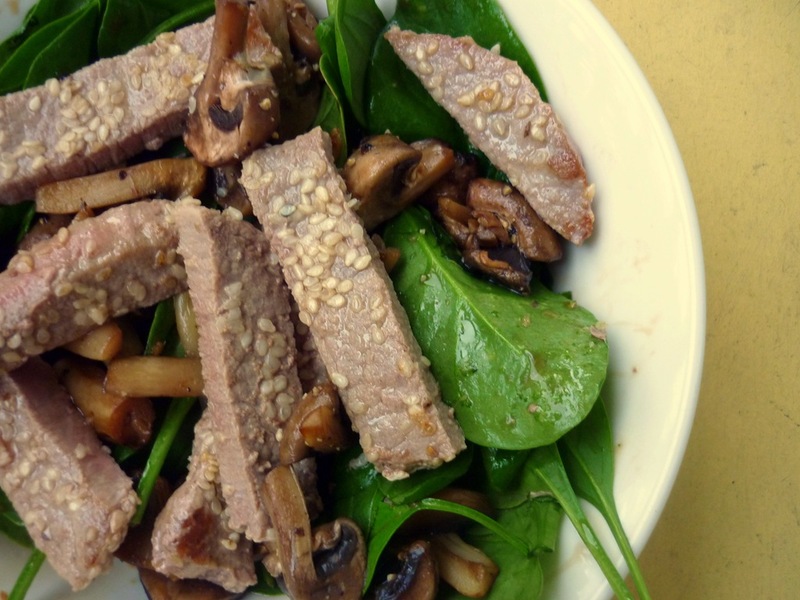 Preparation involves whisking the salad dressing ingredients, toasting the sesame seeds, sautéing the mushrooms and frying the steak – a very achievable week night dinner. I almost wanted to make another one with better meat, just so I could get a photo that might persuade you to try it too! One more night shift to go and once again I really didn’t feel like cooking dinner. After last night’s dinner though, I wasn’t even tempted to get takeaways. I knew I would feel better for eating something fresh and nutritious and I was right. 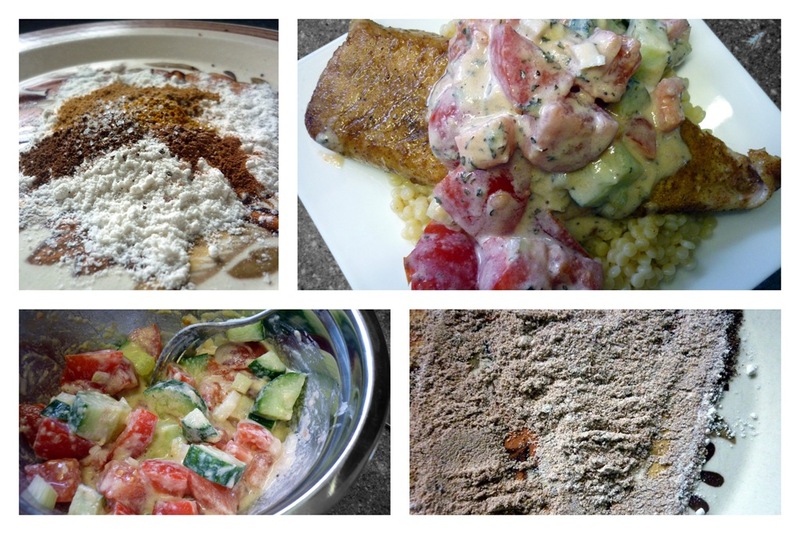 On tonight’s menu was Arabic Spiced Fish with Tahini Salad from An Edible Mosaic. To prepare the fish, you mix the flour and spices and rub it over the fish then pan-fry the fish. Faith suggests finishing the fish off in the oven until it is cooked through but I omitted this step and just fried it until it was done through. The tahini and fresh flavours of the salad are a great accompaniment to the fish. The salad and dressing is simple enough to quickly assemble as the fish is cooking. I served this dish on top of Israeli cous cous which didn’t really go. Normal cous cous or brown rice would have worked better. On another note, I have re-organised my “Mains” recipe page so it is easier to navigate instead of just a long list of recipes. It made me realise how much fish and seafood I have been eating lately! Please feel free to leave comments and feedback – I love hearing from you! The idea of this meal did not inspire me at all. The idea of baked beans as part of dinner just seemed so unexciting and lazy. Oh how I was wrong. 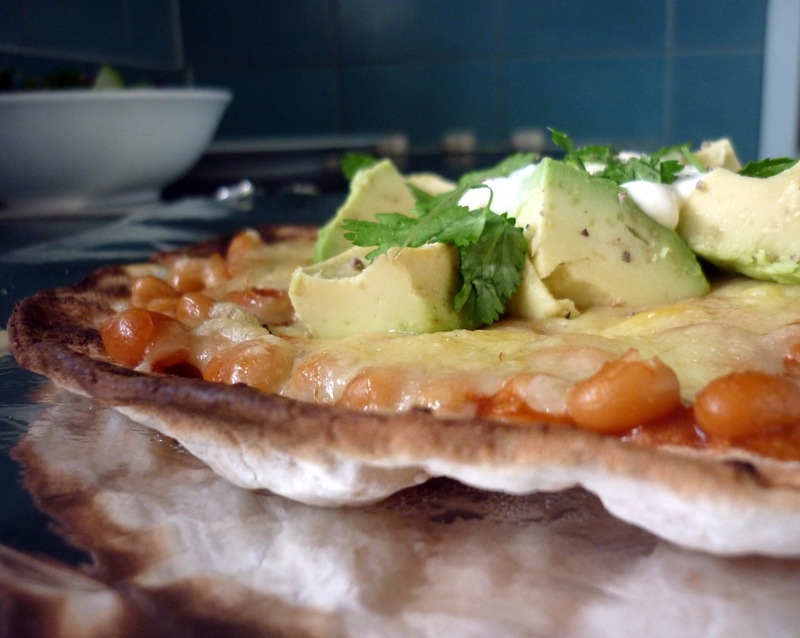 This Baked Bean and Avocado Tostada recipe was super delicious. 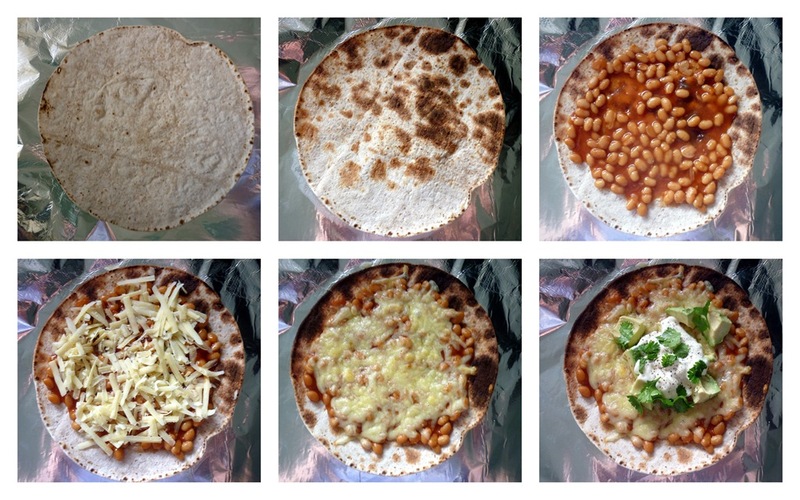 The recipe takes only 15 minutes from start to finish and is adapted from the Healthy Food Guide’s Tasty Bean and Avocado Tostada recipe. To balance out my meal and add some veges, I served my tostada along a salad drizzled in balsamic vinegar. 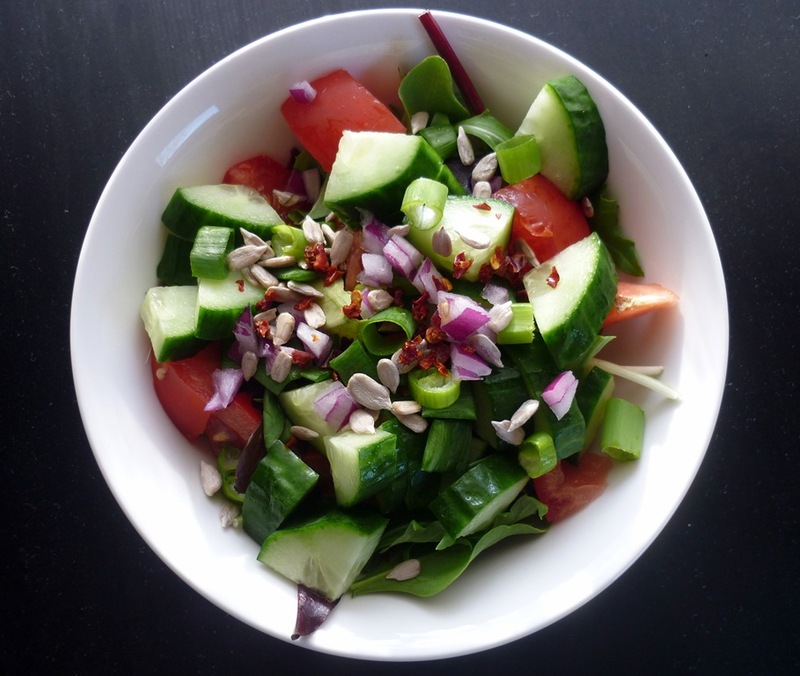 In the salad was: mesclun, tomato, cucumber, spring onion, red onion, sunflower seeds and dried red capsicum. I tried this without the jalapeno at first. It was still really good but, the jalapeno totally makes it.